The Georgia Oak is endemic to the southeast United States, occurring in Alabama, Georgia and South Carolina (however it has recently been extirpated in this state). It is a small deciduous tree, growing up to 10-15 m, with a stunted shrubby appearance and dense branches. This species has ornamental value, with its glossy green leaves, attractive autumn colours of purples and reds and its hardiness to drought and heat. It also provides food for wildlife; its leaves are a food source to larvae of the Red-spotted Purple, Luna Moth and the Southern Hairstreak. Acorns also provide a food source to woodpeckers, the yellow-bellied sapsucker, the tufted titmouse and the Carolina wren as well as deer and small mammals. Today, tourism is a major threat to the habitat of Q. georgiana, the granite outcrop ecosystems found in the Piedmont of the South-eastern USA. Foot and vehicle traffic are both very damaging to the soil of granite outcrops causing soil erosion and compaction. Both of these can be extremely harmful to the organisms living in granite outcrops, including the Georgia Oak which is very susceptible to death from compacted soils. Q. georgiana is an ‘exceptional species’ – this means its seeds cannot be stored in seedbanks. Research is being undertaken to find other appropriate methods of ex situ conservation for Q. georgiana and other exceptional species. Find out more about this project. 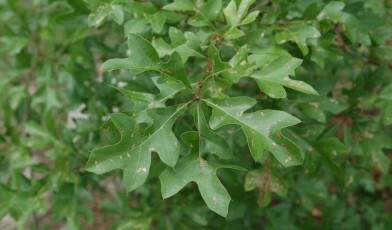 The Georgia Oak is not the only threatened oak species. In 2007 BGCI and FFI jointly published The Red List of Oaks which found that seventy-eight species of oak trees are globally threatened with extinction, including 17 species under threat in the United States. Furthermore, over half of the Critically Endangered or Endangered taxa are currently not known to cultivation and are therefore at a greater risk of extinction, if the threats facing them in the wild are not addressed.